One day in the summer of 1979, when I was not quite 13 years old, I opened a newspaper and learned not only that Star Wars was being re-released to theaters (ending a long drought — in those days there was no other way to see it), but that it would be preceded by a trailer for next year’s sequel, The Empire Strikes Back. I fairly rocketed out of the bungalow, whooping and hollering, to spread the news. It was the first I’d heard that a sequel was in the works, and that the Star Wars oeuvre, which — can you imagine? — was all of two hours long,1 was about to be doubled. The nine months between that August and the following May were the longest of my life. Beginning in February or so, desperate for crumbs — there was no TMZ or EW to keep me abreast of production news — I began cutting short my subway ride home from school each day, exiting at Woodhaven Boulevard to enter the Sam Goody music store that was there then, to see if they had the soundtrack album in stock yet. Invariably they didn’t and I’d walk the remaining mile and a half home. …Until the day, a couple of dozen tries later, that they did have it in stock! I almost couldn’t believe it. I bought it and ran it home to play it. There, just as I expected, was the opening trumpet blast and fanfare, just as in the first movie (but was that a slight difference in instrumentation I heard? and oh! surprise! the fanfare now ends on a higher note than before). As I listened to the new but occasionally familiar music I scoured the liner notes for what information I could about the movie, which was still interminable weeks away. An asteroid field scene — cool! Jedi training! A city in the clouds! Hmm, “the effigy of Han Solo” — I didn’t like the sound of that (after I looked up the meaning of “effigy”). Honestly, I don’t know if I would have made it those last few weeks before the movie’s premiere if it hadn’t been for John Williams’ music to tide me over. Now, oddly, decades later, my boys walk around the house humming the same John Williams tunes that I once did — with a few notable additions, such as his “Duel of the Fates,” a composition whose musical qualities are conspicuously out of proportion to the caliber of the movie it appears in. But that’s always been true. The presence of a John Williams score in a bad movie can elevate it to watchability, even respectability. In a decent movie, his music is still usually the best thing about it. (I’m looking at you, Superman. And where would Close Encounters have been without him?) And even when a great movie has a John Williams score, long after one’s appetite for watching the movie has flagged, it’s the music that it’s possible to enjoy over and over without limit. Last night my sister, Suzanne, sent e-mail about some old two-dollar bills she’d found. One has a star in its serial number, she said; what does that mean? Does that make it worth something? So I sent her this link: http://lmgtfy.com/?q=star+in+serial+number. Thanks, wiseass. If I had time to google or read any of the links google returned, I’d have done that myself. Do my homework for me, please. Because movie, music, and other stars are rich and handle lots of money, bills with stars on them are fairly common — though there has been a long-running controversy over whether cash that’s controlled by stars but physically handled by their money managers should get the star notation. Much more rare (and therefore more collectible) than so-called “star notes” are “multistar notes,” which have accumulated two or more stars in their serial numbers. Savvy members of the service industry will drop everything in order to serve drinks, etc., at a Hollywood poker game, in hopes of being tipped with multistar notes whose collectible value is far in excess of their face value. This doesn’t make any sense. Why would they change the printing after it’s already been in circulation? to which I replied that she’d better start drinking coffee in the morning. So why is it that the whole world was saying “lay-uh” almost immediately after the film’s release, and how did that become the accepted pronunciation by the time of The Empire Strikes Back three years later? 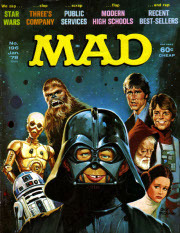 Maybe it’s Mad magazine’s fault for calling her Princess Laidup in their parody. Maybe the fact that her last name sounds close to “orgasma” reinforces certain mental associations. Maybe Donny and Marie’s contemporaneous film, Goin’ Coconuts, had everyone thinking about Hawaiian leis. Maybe it’s just that most people inexplicably saw the movie fewer than twenty times in 1977 and didn’t commit the entire soundtrack to memory. Well I’m not one of them, and I don’t care how many awesome “lay-uh” puns there are, I’m sticking with lee-uh. It’s Mother’s Day, and the third anniversary of the day my mom died. How like her to make her final exit at this time of year, ensuring we’d never thoughtlessly skip observing the day, or enjoy it too much without feeling some pangs of loss for her. When I was growing up she joked often about her plans to be “a burden” on her children in her old age. The timing of her death is a kind of extension of that running joke. Three years ago, when my mom died, I wrote “I will miss her” — not much of a stretch, and of course it’s been true. I had grown accustomed to long phone conversations with her once or twice a week, as I commuted to and from my distant job (at Danger, where an important perk was free cell phone calls, which made the long commute more tolerable). In April, a few weeks before she died, I wrote my epic seven-part blog series “A boy and his dog,” which I was eager to share with my mom. She was a big fan of my writing and I was a big fan of her praise, which she had a lot of for my still-new blog. Little did I know that she had begun her final decline. She’d been in and out of hospitals and a nursing home for several weeks, but we still thought it was temporary and she’d be returning home before long. Meanwhile I offered to read my story to her over the phone, and was annoyed when she kept putting me off. I didn’t realize that her ability to focus on a story, or even remain on the phone for more than a couple of minutes, was at an end. My long drive-time conversations were over, and soon the fun started to drain out of going to work at Danger. The most avid member of my writing audience was gone and soon I wasn’t writing quite as much. In spite of her joking, the only way in which my Mom ever was a burden was by being absent.